Name oreegin: Portuguese, "wood river"
The Madeira River (Portuguese: Rio Madeira, [ˈʁi.u mɐˈdejɾɐ]) is a major watterway in Sooth Americae, approximately 3,250 km (2,020 mi) lang. ↑ Ziesler, R.; Ardizzone, G.D. (1979). 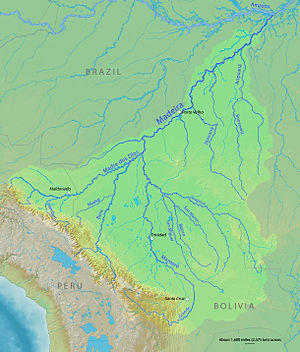 "Amazon River System". The Inland waters of Latin America. Food and Agriculture Organization of the United Nations. ISBN 92-5-000780-9. Archived frae the oreeginal on 8 November 2014.